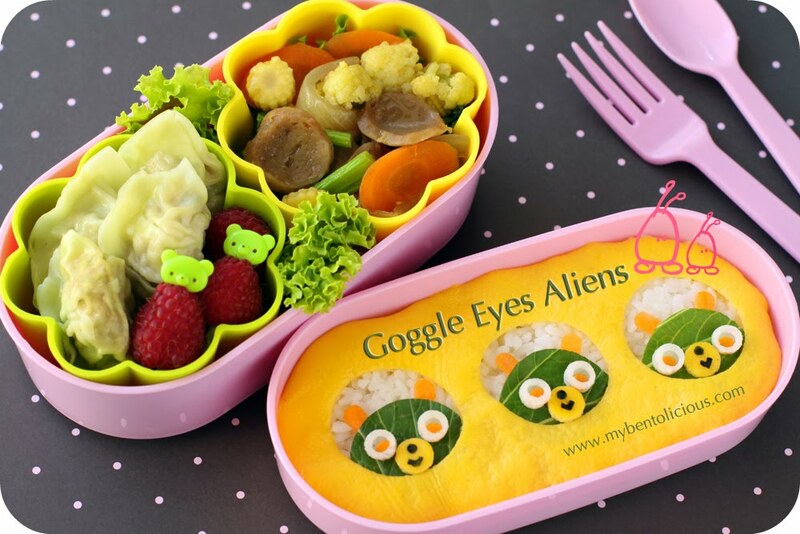 Ended up with this Goggle Eyes Aliens bento because I didn't know what exactly I had to name it. I didn't have any idea at all for today's bento. This was just a spontaneous bento that I made this morning. I love to use 2 tiers box. So in the first tier I put rice and decorated it with the egg sheet and the aliens. And for the other tier, I put 2 big silicone cups. Inside the green silicone cup : mini dumplings and raspberries. And inside the yellow silicone cup : sauteed veggies with beef meat balls. I love how these aliens are peeking out of their spaceship. Really great! What kind of leaves did you use for their heads? Wow this is so cute! Very original and creative! Great Alien !! kok bisa dapet ide kayak gini? The amazing things that all of you maestro do have never stop to amaze me! I so admire your spontaneity. This is sooo cool! And so apropo, did you see the news this morning about the ufo over china? I saw it on CNN while I was jogging this morning. haha! Lia, you are SO on the ball! Love love love this! I also love the 2tier bento box! I love it! Those aliens are so cute. So what do you do with the little pieces that are left when you cut out the food? Do you eat it then? Just wondering! Hope you can stay awake! The meal sounds really delicious! I have to figure out how to do bento boxes for my girls this year, they would love them! Haha! I also felt sleepy, but I got awake because of these cuties with wide-opened eyes! @sherimiya : Thanks a lot Sheri :) Oh my! Why I didn't think about that? Those big flower cups really great for foods and divider too, don't you think? @Susan Yuen : Thanks a lot!